I was going to share with you my recipe for refried beans today, but then I got carried away with a little project and decided I'd share this with you instead. Come back next week for the beans cause they are DEEEEE-LISH! For the better part of last night and today I've been working on our little play nook. Since we've lived in this house this little space has evolved quite a bit, but I think we've finally found the right fit. 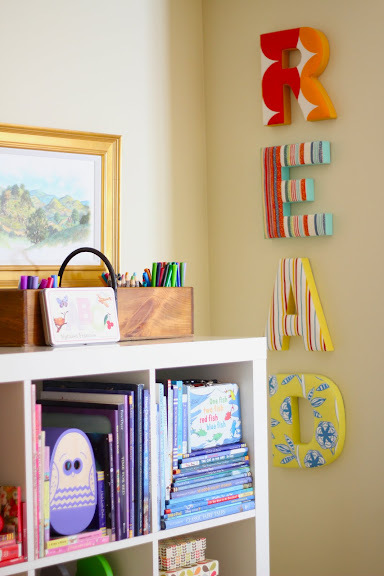 The first requirement for this space was to have a place for all our children's books (we've got tonz) and the second requirement was to have some storage for toys. We went to IKEA and got the Expedit bookcase in white, which you see everywhere, but there is a reason: it's clean, inexpensive, lends itself well to a variety of styles and is GREAT for storing things. I totally stocked the bookcase to the gills. I was shocked at how much I was able to fit in it. Visually, I think the individual cubbies could stand to have some breathing room in and around them, but whatev's. I'm sure I'll be doing lots more tweaking a couple days from now after I've had time to live with it and really study it. I color coded all the books and some of the toys. I did this solely for selfish reasons-- I'm sure this will put a pep in my step when I walk by. A shot of the little table and chairs. The large painting is a scene from the The Three Little Pigs and the other painting is of Humpty Dumpty swinging. The long wooden vessel with the metal handle has crayons, markers, and colored pencils in it (safely out of reach of little hands). The wooden counting scale is a toy from my childhood that I was fortunate enough to snag before it went to D.I. It's still in perfect condition and I love the primary colors. 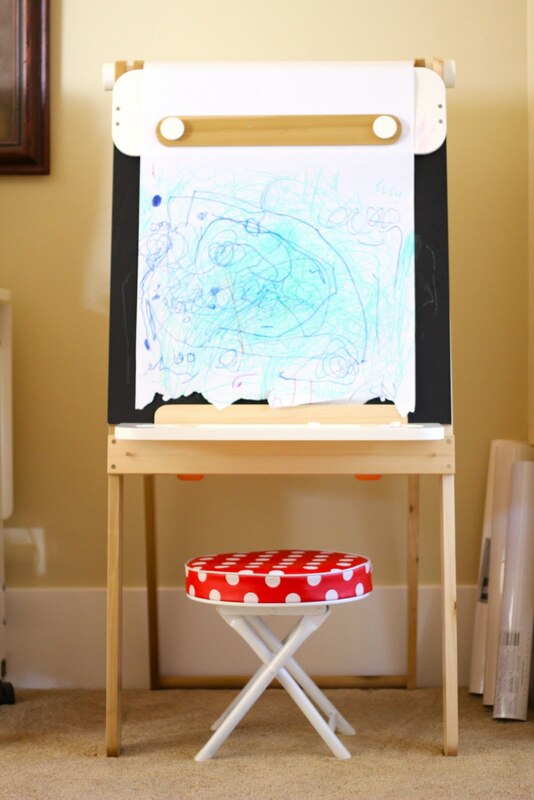 This art easel sits on the wall opposite of the bookcase. I hope you all have a fabulous weekend and hopefully there will be signs of Spring in your neck of the woods. As always, thanks for being here and reading our little slice of the internet. Love you guys! seriously, how cute is that?! I love that you color coordinated the different nooks. so crafy, so cute super mom! Wow. This is my dream kids corner. You are amazing. I found your blog just a few days ago and have been loving it. Thanks so much for the tour. Your corner is darling. Holly- Thank you! YOU ARE super mom. What a gorgeous nook! I adore that READ-may have to copy that for our playroom someday. ;)And I totally organize our books by color-but all we seem to have is yellow books, lol! Those bells look like fun too! Love the polka dot seat too. Ok, just love everything about this room. Jess- Thank you! You are so sweet. The READ letters are one of my favorite elements, too. Wow Bri... it looks spectacular! Great job! Will you comet my house and do my kids nook? You are awesome and it looks great! I love how you color coordinated the cubbys! Perfect! So Cute Bri! can you come do that at my house? I'm so speechless Bri. Wow. I don't think people realize how hard it is to do shelves until they've tried; it's so hard to get it to look right. You did a perfect job. 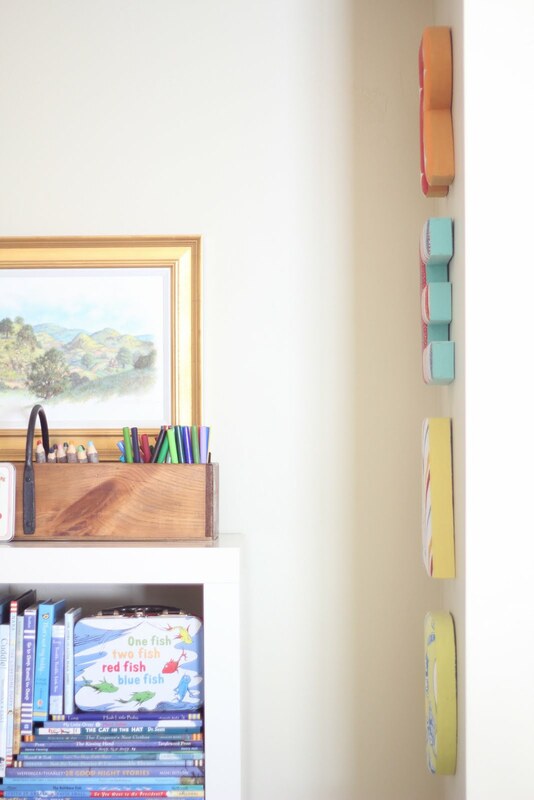 I especially love the couple of shelves where you blended the vertical and horizontal books - I've never seen it done quite like that, but I predict that I'm going to steal that idea. Where did you get that adorable round rug? Love it. Your little ladies are lucky to have such a hip little play spot. Amazing! Love tat bookshelf! I wanna get one! You did a great job of organizing/decorating it! Love that read sign too! seriously, ADORABLE! You are amazing! Wow! You guys are all too kind. Thanks for all your comments. I love all you guys! totally completely love that! looks awesome! you are too cute. knock it off. or at least come to denver and help me with my house!!! miss you guys. ps. tom has put in a request for your steak sandwich recipe. he says it's his favorite (along with your texas sheet cake :) ). your space looks awesome. color-coded books? oh my. i better get busy! I think it's really pretty, but being a bit OCD when it comes to books, having sets (the Olivia books, case in point) on separate shelves would drive me BATTY. What a lovely corner! I'm especially fond of the color coding books... just love how the colors blend. I was wondering where the table and chairs are from? Anonymous- Ha! I've never been called OCD before. :) You should see my pantry! Color coding the books was purely for the visual fun. Nothing more, nothing less. Athena- Thanks! The table and chairs are from The Land of Nod, which were bought online. They were a Christmas gift to my kids from the grandparents. And we LOVE them! I love the look, it's gorgeous. But having 2 three year olds, I can't imagine this being practical. 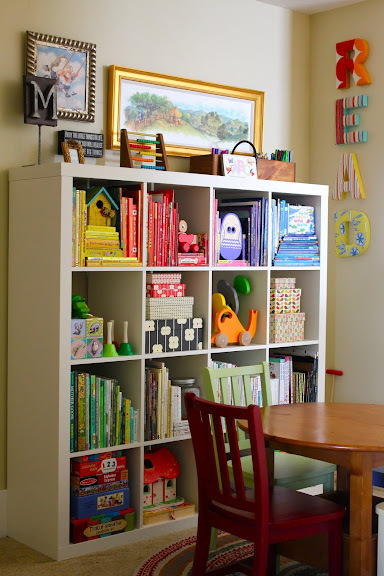 All that stuff jammed together on the shelves, hard for little ones to put away (or take out just one thing). 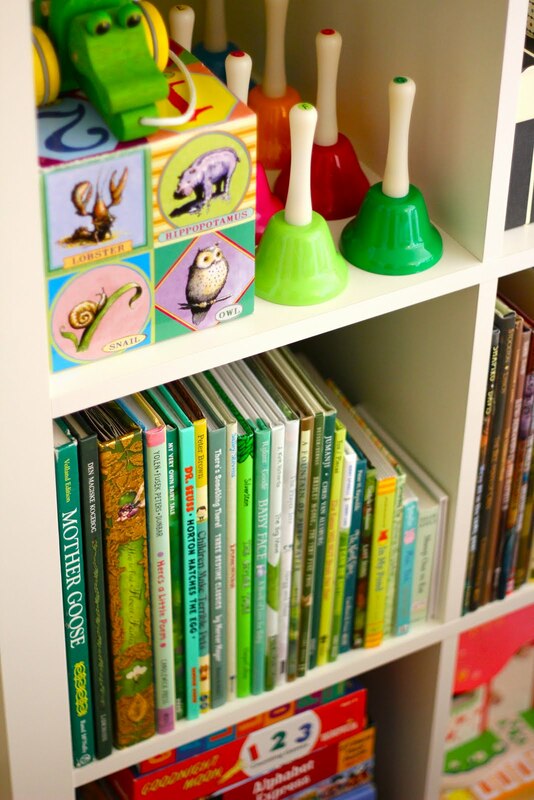 And it would drive me nuts too not to have book sets (or logical groupings, like Dr. Seuss books) all together. But it's pretty. I agree--this is not the set-up for book lovers--those are not stacks crying to be read! Love this space. Can you let me know where you found the table and chairs and also the wooden box that you have the coloring pencils in? The table and chairs are from Land of Nod (gift from grandparents and bought online) and the container holding the markers and pencils was something I found in a big pile of stuff my mom was giving away. I'll have to ask her where she got it. It's super handy and I love it.